The Turkish lira rose slightly on Tuesday, lifted by better than expected Turkish Industrial Production (Feb -5.1% vs -6.5% f/c and -7.4% prev). 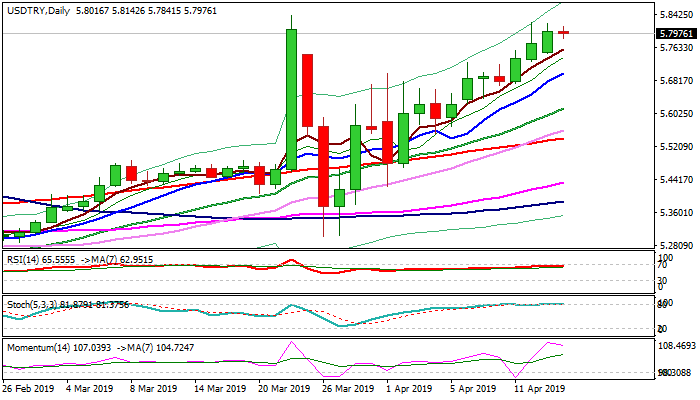 The USDTRY bulls may take a breather as overextended studies suggest adjustment (momentum crested and turns lower and stochastic is attempting to emerge from overbought territory) with solid data expected to add to scenario. Overall structure remains strongly bullish and consolidation is likely to precede final push through recent peak at 5.8410 and attack at weekly cloud top (5.8732) and Fibo 38.2% of 7.1074/5.1323 (5.8868). Rising 5SMA offers initial support at 5.7573, with deeper dips expected to hold above ascending 10SMA (5.7003) and keep bulls intact.